The Transportation Security Administration (TSA), within the Department of Homeland Security, screens or oversees the screening of more than 650 million air passengers annually at more than 450 airports nationwide, and attempts to balance its aviation security mission with the freedom of movement for people and commerce. In 2011, TSA began developing new security procedures intended to strengthen security and improve the passenger experience by shortening lines and wait times. These new procedures apply risk-based, intelligence-driven screening concepts and enhance the use of technology to determine passenger risk prior to travel. As part of its responsibilities for securing civil aviation, TSA ensures that all passengers and their accessible property are screened and prohibits individuals from carrying onto aircraft items that it determines to be a threat. TSA maintains a public list of such items, known as the Prohibited Items List (PIL), and updates it as necessary. 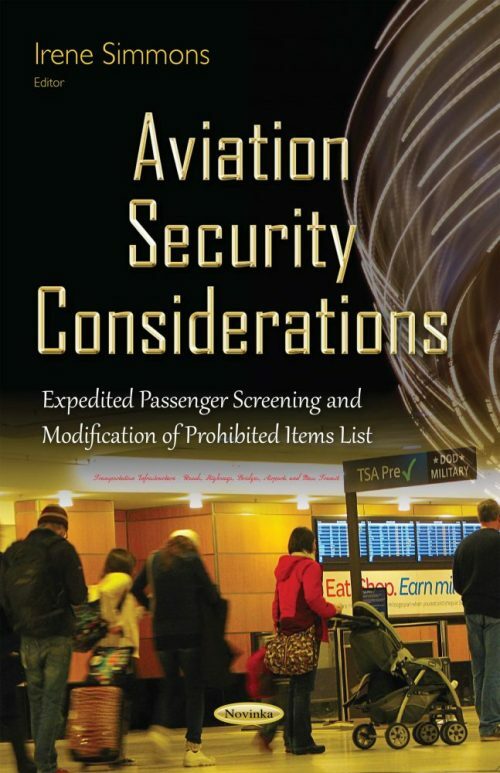 This book examines, among other things, how TSA has developed, implemented, and used expedited screening; how TSA assesses passenger risk; and the extent to which TSA has determined the Managed Inclusion system’s effectiveness. Furthermore, the book examines on what basis TSA modifies the PIL and the extent to which TSA assessed risk when considering recent modifications to the PILl; and the extent to which TSA involved stakeholders when considering these modifications.